“The Hunger Games” Jennifer Lawrence isn’t fighting to the death in the woods anymore but she is fighting to survive. “House at the End of the Street” does have a few dead ends though. This new horror and thriller movie provides a few scares but it does lack a few twists and turns that should have been there. 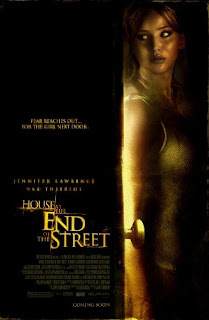 “House at the End of the Street” follows Elissa Cassidy (Jennifer Lawrence) who moves to a new town with her mother. Their new home is spacious, attractive, set in the woods and for some reason, very reasonably priced. Mom and daughter learn that they live next door to a house where a young girl had murdered her parents. Elissa becomes friends with the surviving son, but the friendship certainly is a concern to Elissa’s mother, and soon to Elissa. Sarah (Elisabeth Shue), Elissa’s mother, forbids her daughter to spend anytime with the surviving son Ryan (Max Thieriot) but Elissa can’t resist his charm. And although he has charm and seems to be a cutie, you know he’s up to no good. The action and suspense doesn’t start to take effect until the end. It takes a long time for the story to unfold and get going. The movie is an hour and 40 minutes yet it feels way longer in the beginning because the story drags. If Jennifer Lawrence wasn’t the star, we would have a problem but she kept your attention. What is impressive is the ending. The conclusion to the story is something you won’t see coming. I had no idea. And when a movie can do that, it’s easier to forgive all the crap before it. There were a few scenes that make you jump and it’s more of a psychological thriller. No ghosts or paranormal crap in this movie, which is always a plus. The scariest thing is watching a movie that could actually happen. This movie is perfect for girls in high school who want to scream out loud at a sleepover in their footy pajamas. “House at the End of the Street” may not supply you with what you need this Halloween season but for a few scares, it’ll suffice.